The plans of the German Army in 1914 were nothing if ambitious, as they had to assemble by railway no less than seven armies, on a front of 500 km, complete with all their horses and supplies as part of their mobilisation plan. The limiting factor was the number of railway tracks crossing bridges over the Rhine while the opposing French armies had more railway lines leading to their mobilisation areas (see Mitchell). 'All the European powers had built up vast armies of conscripts. The plans to mobilise in these millions rested on railways and railway companies cannot be improvised. Once started the wagons and carriages must roll remorselessly and inevitably to their predestined goal’. AJP Taylor. Mobilisation started on 1st August and the first German advance started on the 8th August, crossing the border into Belgium. Once the main attacking armies were assembled, they had first to breach the Belgian defences at Liege and along the line of the river Maas, which blocked their advance through the Walloon provinces. 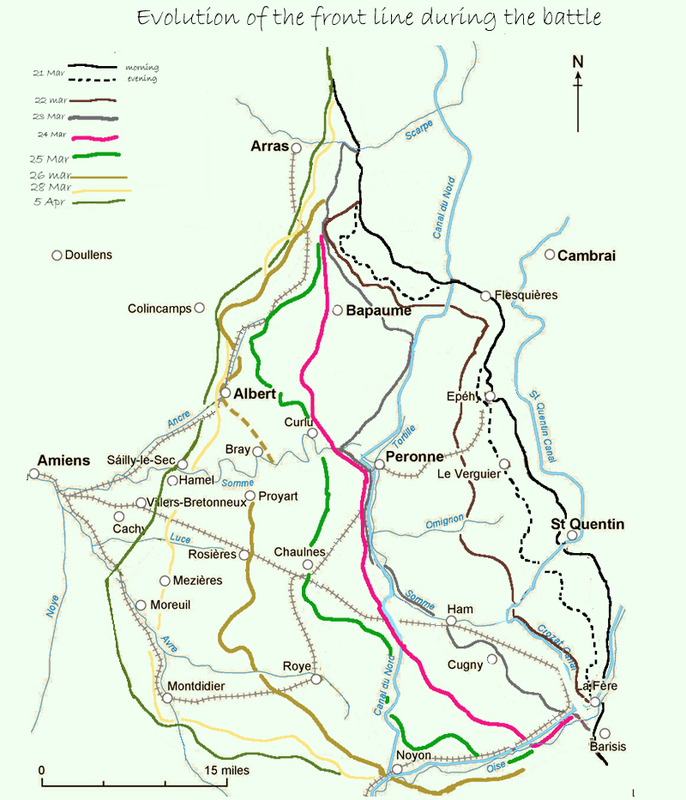 The Schlieffen plan required that 1 Armee pass Brussels by M+22 (23rd August) a distance of 150 km overall, with the Liege falling on M+15 (16th August), they had to cover the 100 km to Brussels in 7 days or a steady 15 km a day. The advance was planned to cover the next 220 km from Brussels to Lille to Lens to Abbeville a distance of 220 km by M+31 (1st September) in 9 days or 24 km a day. However in 1914 the German armies are following a revised plan that sees 1 Armee cut off the corner of the advance and advance in a southerly direction towards Mons which they reach on M+22 (23rd August) when they bump into the British Expeditionary Force. The actual distance from Liege to Louvain to Brussels to Mons is 155 km which was covered in 7 days or 22 km a day but trajectory of the army is already 120 km to the east of where the Schlieffen plan wants it. The days from the 23rd August to the 30th August (M+29) see the 1 Armee fight their way forward from Mons to Cambrai to Albert to Cantigny covering a distance of 165 km in 7 days or still 24 km a day. 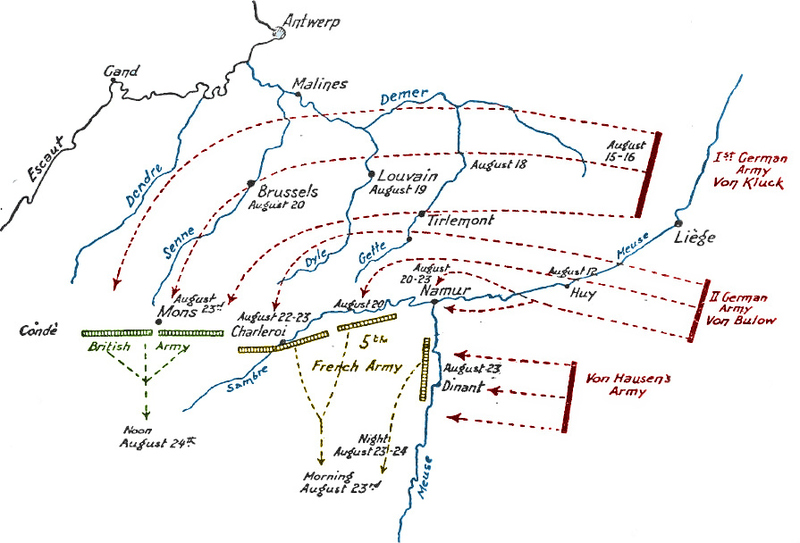 It is at this point that the decision is taken to move to the east of Paris and the Schlieffen Plan is abandoned as the right wing of the 1 Armee advances only as far as Chantilly 55 km away while the left wing advances to the Marne, a distance of 110 km reached by M+35 (5th September) or 18 km a day given the scale of the fighting. 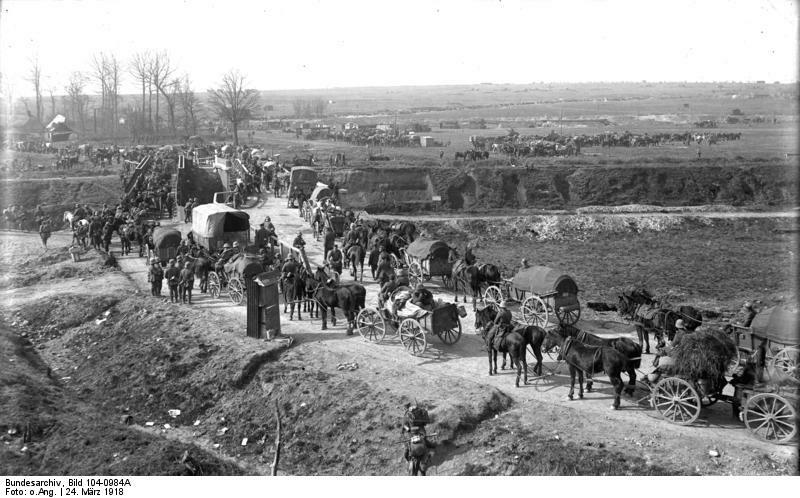 Interestingly under the Schlieffen Plan, 2 Armee should have been at Chantilly around M+37, so in that sense the German armies were ahead of schedule by around 5 days only they were 150 km too far to the East as 1 Armee was due to reach Evreux on M+37. The point to note however is that throughout the advance the troops have been moving a the regulation speed of 22 km a day as set down in the German Army Field Service Regulations (1908). As pointed out by van Creveld in the chapter "The wheel that broke" in Supplying War the main problem facing the German army was congestion on the roads in the early part of the campaign and sustaining the advance day after day for 25 days of continuous marching (M+15 to M+40). added to which was its share of the 13 MG Kompanie with 87 horses and 12 wagons/limbers carrying a mere 6 machine guns and a spare. This four fold increase in transport piqued my interest and I went to the standard reference books to research the transport at Division and Corps levels. The principal reference in English is David Nash's "Imperial German Army handbook" and in German is Cron's 1923 "Die Organisation des deutschen Heeres im Weltkriege" however neither of these give much information on unit transport at divisional level and other sources such as the "The World War One Databook" and George Nafziger's Orders of Battle at Combined Arms Research Library lacked detail. I was unable to access Dirk Rottgardt's "German Armies’ Establishments 1914/18" series as there are limited library holdings. Given this shortage of material I went back to the German Army Field Regulations (1908) and Duties of a General Staff Officer (1908) to build up the information from these contemporary sources. The structure of the Division is straightforward, it consisted of two Brigade, each of two Regiment consisting of 12 Infanterie Kompanie divided into three Bataillon (I Bataillon 1-4 Kompanie, II Bataillon 5-8 Kompanie and III Batallion 9-12 Kompanie) with 13 MG Kompanie of 6 heavy machine guns. In addition there was a Feldartillerie Brigade of two Regiments, each of 12 batterie divided into two bataillon with a total of 72 field guns and howitzers. Divisional troops consisted of 3 squadrons of cavalry, pioneers, bridging train and medical services. This gives a total of 18,171 personnel, 4,368 horses and 554 vehicles in 12 battalions of infantry, 3 squadrons of cavalry, 24 HMG, 54 field guns and 18 howitzers. The units concerned with supply in 1914 were the Armee, Korps, Regiment and Kompanie so an examination of the Korps structure is required to gain an overview of the transport park. Each Korps contained: 2 Infantry Divisions, 1 battalion heavy field howitzers (Fuss Artillerie Abt. schwere Feldhaubitze), aviation detachment, telephone detachment, pontoon train, searchlight battalion, 2 munitions columns battalion, 1 Foot Artillery munition column battalion, 2 Train battalions, 1 Jaeger battalion with an MG Kompanie, cyclist company and a Jaeger motor column. Each of the two Munition-kolonnen Abteilung had 4 infantry and 9 munitions columns while the one Fussartillerie Munition-kolonnen Abteilung had 8 heavy munitions columns and the Train Abteilung contained 12 field hospitals, 2 remount depots, 6 provisions columns, 2 field bakeries and 7 equipment columns. This gives a total of 44,600 personnel, 16,250 horses and 2,550 vehicles, although there are variations in Armeekorps structure and this represents an 'typical' first line formation. The differences with the 1918 division are shown in Nash "Imperial German Army Handbook" which gives totals of 13,000 personnel, 1,600 horses, 350 vehicles, 10 motor vehicles, 216 LMG, 130 HMG, 76 mortars, 36 field guns and 12 howitzers. The difference transport can be illustrated by the number of men per horse which was 4.2 in 1914 and 8.1 in 1918, while the number of vehicles per heavy weapon was 5.8 in 1914 which drops to 1.4 in 1918 and similarly there are 7.9 horses per vehicle in 1914 and only 4.6 in 1918. This illustrates that although the overall transport had been streamlined by 1918, this had been taken too far in the reduction in horsepower with field guns now pulled by teams of four instead of six. Nor had the transport been adjusted to keep up with the inflation in heavy weapons, machine guns, mortars and howitzers with reductions in both the number of wagons and horses to haul both the weapons and their munitions. Comparing the advance in March 1918 during Operation Michael, the offensive covered the 60 km between St, Quentin and Villers-Bretonneux in 15 days, an overall rate of just 4 km a day and even the period of most rapid advance between St Quentin and the Somme River a distance of 23 km was covered in four days a rate of 6 km a day, a far cry from the long marches of 1914 and was over relatively unspoilt open country before reaching the old Somme battlefield on the far side of the river. The British fighting withdrawal undoubtedly slowed things up but then again the fighting at La Cateau and Mons in 1914 had done the same. This was a quick study prompted by the lack of published material on this the hundredth birthday of the Great War and further work needs to be carried out on this subject. Nonetheless this initial view gives pause for thought as to the mobility of both 1914 and 1918 German forces.